Zamorano University, also known as the Panamerican Agricultural School, was founded on the principle of applied knowledge and learning by doing. Set in the dry subtropical Yeguare Valley some 30 km. from the capital of Honduras, Tegucigalpa, it hosts students from all over Latin America and yearly graduates future leaders in agricultural production, processing, business and environmental and social sustainability. 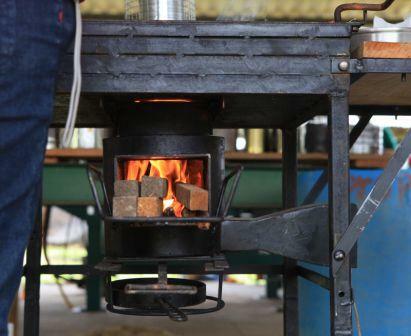 During the last week of September, 2011, Paul Anderson better known as Dr. TLUD, and Christa Roth took a diverse group of stove enthusiasts through a week long intensive stove camp that lived up to Zamorano’s traditional learn by doing standards. Christa Roth showed up a week early to hammer down the final touches on the Spanish translation of the GIZ-HERA Manual “Microgasification: Cooking with gas from solid biomass” as the camp was to be held entirely in Spanish. 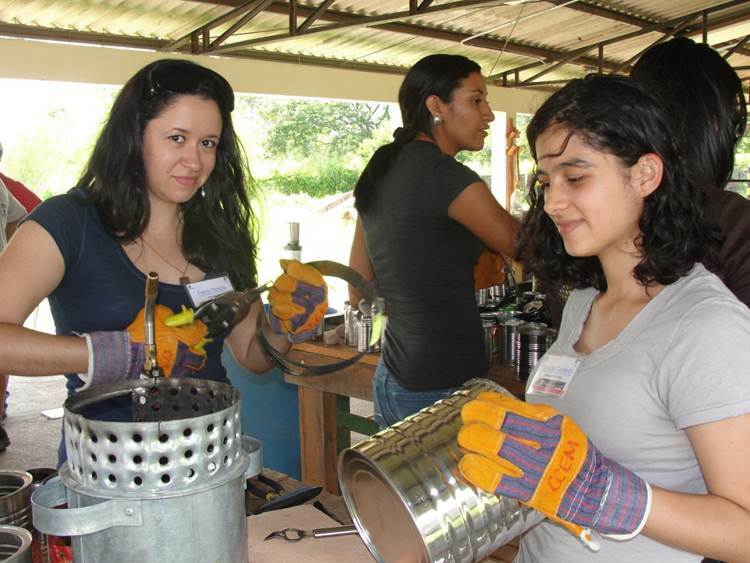 Zamorano’s Natural Resources Management and Forestry Department, headed by Professor Timothy Longwell, was hosting the camp in their Stove Certification Center, and had assembled a team of organizers and translators ready for the task. Due to the utter lack of material available in Spanish, Roth and her team of translators took it upon themselves to coin a number of terms to equip the Spanish speaking stove world with adequate terminology for their ongoing learning journey. The stove camp was attended by representatives of El Salvador, Nicaragua, Costa Rica, Panama, Colombia, and of course Honduras. 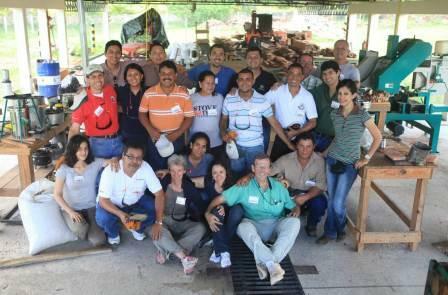 Many of the participants had attended the first Zamorano stove camp in 2010. With only two years of practice, Zamorano’s Stove Certification Center has all it takes to organize a smooth running stove camp. There is a sawmill on site (producing endless quantities of fuel to test out in the burners along with the corn husks and diverse agricultural residues), as well as emissions measuring equipment, a wide selection of tools, and most importantly a staff of highly qualified personnel always ready to lend a hand. One of the few complaints uttered was that the cozy accommodations at Zamorano’s Kellogg Convention Center could hardly qualify as “camping”. Once the basic concepts of microgasification had been covered and some simple TLUDs were demonstrated, the group was divided into three smaller sections to work on projects that went well beyond the basics of microgasification, something that made this stove camp special. One team developed an institutional gasifier with remote burning capabilities for semi-industrial use, another a T-Rocket merging the rocket stove with the TLUD, and the third design was the innovative TChar: a TLUD gasifier designed over a charcoal cooker to give people the option of saving the char for application to soil as biochar, or to continue cooking with the charcoal for greater versatility and near complete energy use. The TChar design could allow people to test the biochar in home gardens and small scale production plots. Before closing, evaluations were done and concerns were discussed. Although the camp received generous support from the TPW Energy Collaborative which lowered tuition fees for participants, one of the things that stood out was the discrepancy between what is considered reasonable to pay for a stove camp in the developed world and what can be sacrificed by regular folks in Latin America. The total cost including accommodations, meals and travel excludes a large number of people who would benefit immensely from workshops like this. An ongoing discussion has ensued, considering funding and sponsorship possibilities, as well as more cost effective alternatives like shorter and more mobile, smaller camps with those who are pursuing this work in El Salvador, Nicaragua and Costa Rica. What is important is that a network of stove enthusiasts has been established in the region, and there are now many at work in keeping the fire going. The week ended with an “open kitchen” attended by Zamorano students and faculty, the majority of whom had never seen nor heard of microgasification before. Everyone was amazed by how good the food was but also by the ingenuity of the designs. 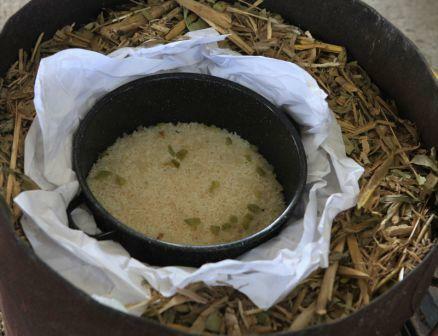 Roth’s fireless cooker also caused quite a stir, since people are accustomed to keeping the fire on once a pot reaches boiling point, and simple fireless cookers made of common insulating material can relieve any cooking operation of this potential waste of energy. TLUD fabrication; courtesy of J. Espinosa. Testing emissions of the TLUD; photo courtesy of G. Flores. 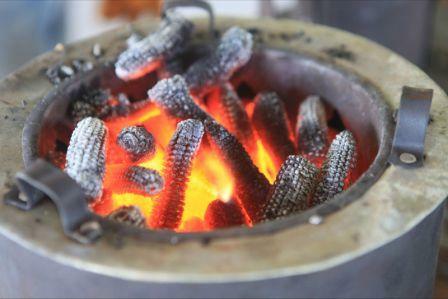 A TLUD gasifier designed over a charcoal cooker to give people the option of saving the char for application to soil as biochar, or to continue cooking with the charcoal; courtesy of J. Espinosa. 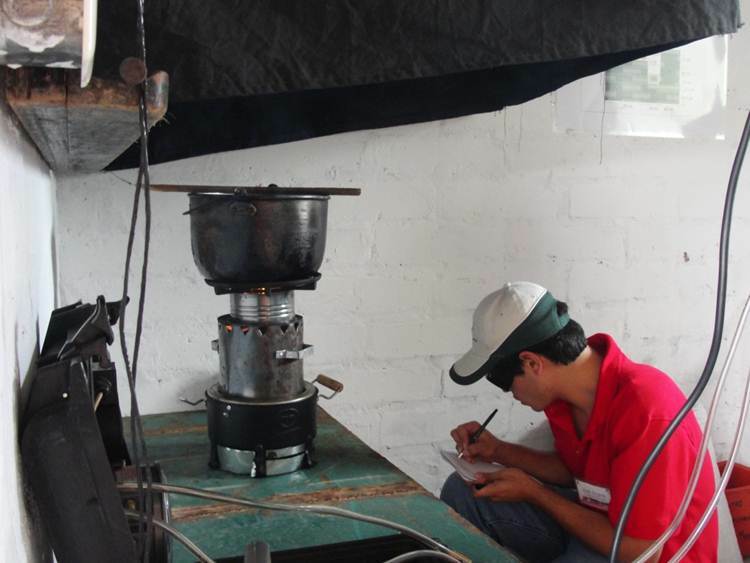 A T-Rocket merges the rocket stove with the TLUD; courtesy of J. Espinosa. A fireless cooker; courtesy of J. Espinosa. Conference participants; courtesy of J. Espinosa.